Public transportation in San Francisco wavers between “generally okay” and “a terrible experience.” Trying to get to Day of the Devs, Double Fine and iam8bit’s annual event that allows people who game to play upcoming indie games, was the latter for me. I showed up only a little late, about half an hour after the event began, and it was already packed full of people. The amazing thing is that the kind of people there were incredibly diverse: people of color, queer people, children and their parents, women, men and nonbinary people of all stripes. It was very exciting to see all these different types of people come together for a common purpose: to game. If I could offer a suggestion for others when they attend these kinds of events, it’d be this: bring a friend. Going to this kind of thing alone is just an invitation to get overwhelmed by anxiety and then have nobody to support you, which is exactly what happened to me. Being crowded by people all the time and not knowing anyone there made me extremely anxious from the moment I walked in the door. I even went to a place called the “Chill Room” to get some air, and that place had no chill at all, let me tell you. The venue the event was held in opened with a hallway where a small art gallery had been set up. The art on display was, of course, all gaming-themed. Some notable pieces included a gorgeous painting of Metroid’s protagonist, Samus Aran, as well as a huge map littered with locations that each referenced a different videogame. From the entranceway, I could head to the main showroom, where most of the games were on display. In addition, there was a raised stage where Double Fine head Tim Schafer introduced the event. Afterwards, he passed the mic on to Polygon’s Nick Robinson, who conducted interviews and previews of games not playable at the event. There was also the VR Room, where all sorts of virtual reality games were on offer. That room, maybe a little bit larger than my kitchen, was so full of people that I couldn’t even get in. Then there was the Chill Room, where some of the more brooding games like Tacoma could be played. 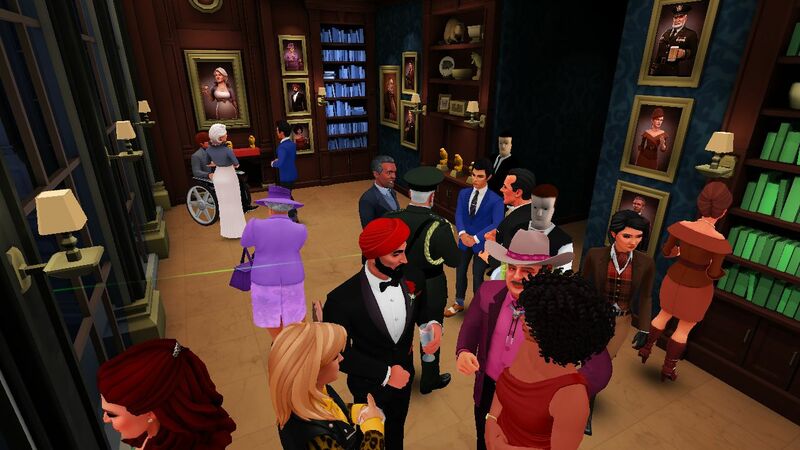 Of course, there were also six or so computers playing Spy Party, where one player plays a spy trying to complete objectives at a crowded party, and another player plays a sniper trying to find the spy and execute them. The game would elicit hollering and raucous laughter from the players each time a suspenseful round ended, which promptly defeated any chill the room was trying to evoke. One thing that struck me as odd about the event is that while there were several games on offer there (40! ), very few game developers manned them. At an event like the Games Developer Conference or E3, game devs (or a PR person) will be on hand to help people who are playing their game in case they get stuck or have a question or the game bugs out on them, but that wasn’t the case here. It felt like a missed opportunity to me, since this was the perfect place for people to connect the games they were playing to a person that they can relate to. This seemed even more important when you consider that pretty much all of the games were not out yet (besides games like Gang Beasts, which is in Early Access, and Rising Thunder, which is in beta), and this would be an opportunity to pitch the game in addition to letting people try them out. As for the games on offer, there was quite an eclectic array. There were games I’d heard before and many I hadn’t. Hyper Light Drifter is a game I’ve been following since its successful Kickstarter campaign, and it definitely had the longest line for the entire time I was at the event, to the extent where I could barely see the TV that it was being played on. 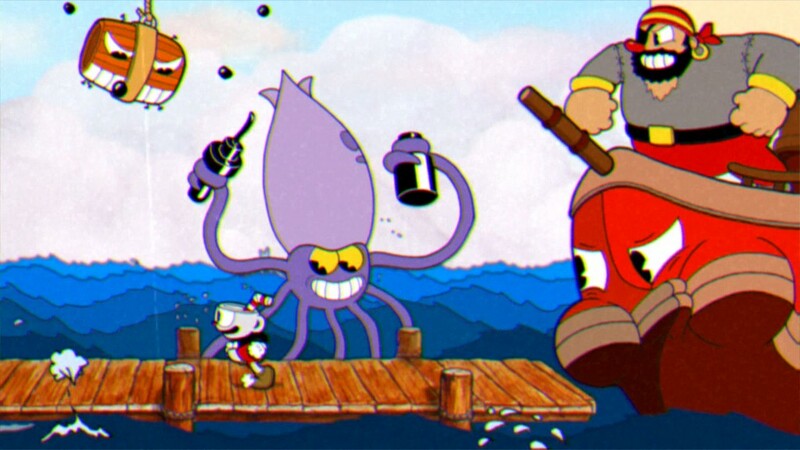 Cuphead was there too, making a reappearance after it turned heads at E3. The art style, evocative of classic cartoons like early Disney (except, well, in color) or Fleischer Studios, was even more gorgeous in person. Death’s Gambit is a game that caught my eye that I hadn’t heard of before. It’s a side-scrolling action game in the vein of something like Dust, but the art was incredibly captivating. 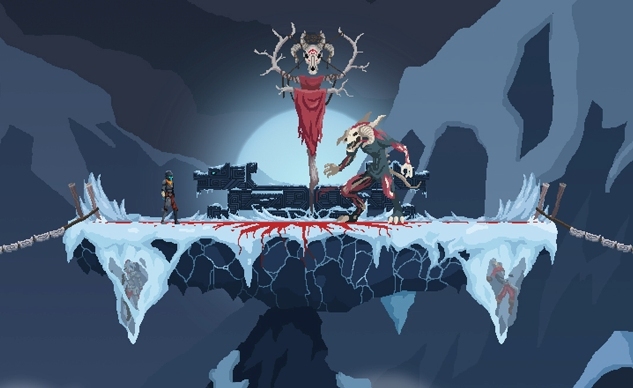 The art style, what seemed to be a mix of hand-painted art and pixel animation, conveyed a world that seemed heavy with history and a mythology of its own. Tharsis is another intriguing game, involving a mission to Mars and things going wrong, as they always do. It also involves dice! It seemed almost like a digital adaptation of a boardgame at first glance, but it is definitely trying to do its own thing. There were a couple of games that, sadly, didn’t lend themselves well to the event’s atmosphere. Capy’s Below was too dark and moody to really tell what was going on with the harsh lighting, and Infinite Fall’s Night in the Woods is a game I want to experience alone with headphones on, not surrounded by people in an all-too-loud gaming venue. After about an hour and a half, my anxiety got the better of me and I beat a hasty retreat. Looking back, though, everyone I saw was having fun and smiling. Double Fine and iam8bit made a very good choice to have this event be free, because it allowed anyone to come and get lost in a game. So many gaming events are closed to the public, or focused more on selling the idea of gaming as a lifestyle instead of actual games; Day of the Devs gives everybody an opportunity to try out cool new games, perhaps expanding their idea of what a videogame can be. While I definitely need to go with a friend next time, I am excited to learn more about the games I saw, and I think there should absolutely be more events like this in the future. Bryce Duzan is a freelance journalist and game designer, and strives to bring a queer perspective to boardgames and tabletop RPGs. He can be found on Twitter as @Spincut.